High-quality underwater LED lights to enhance and improve your pool. Fibre Optic FX is proud to offer premium LED pool lights for homes and businesses alike, designed to perform and engineered with complete safety in mind. We supply quality LED water lights that create a pleasant atmosphere, improving and enhancing every aspect of the experience. When shopping for LED underwater lights in particular, it's important to ensure that the devices you purchase are capable of coping with the unique conditions of pool environments. Our above ground and submersible LED lights for UK customers feature the latest technology in high-output, low-energy lighting. Whether looking to make a statement with an extraordinary colour changing LED swimming pool light or simply bring essential illumination to your pool with a series of LED pool lights you can count on, Fibre Optic FX has you covered! For more information on any of our products or to discuss your requirements in more detail, reach out to a member of our dedicated customer service team today. Whether out to create a stunning visual masterpiece or simply enable 24/7 use of your pool, you'll find exactly what you need in our custom LED swimming pool lights. 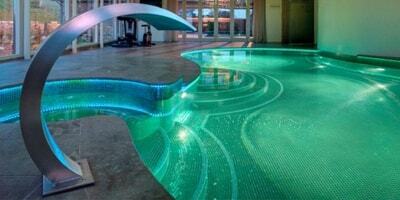 Our LED lights for swimming pools can be customised to suit most tastes and preferences. From basic in ground LED lights around the pool to the most stunning LED floating swimming pool lights money can buy, we've got everything you'll need to improve and enhance your pool. What's more, with our bespoke design services, the vast majority of LED swimming pool systems can be easily integrated with advanced control systems. Activate and deactivate your lights at the touch of a button, set up a convenient timer for automated activation or use a dimmer to create the perfect mood for any occasion. Our simple yet effective LED pool lighting solutions cover all personalities and preferences across the board. Fibre Optic FX takes pride in offering reliable LED pool lights that are guaranteed to go the distance. Representing great value for money, LEDs have the potential to last an incredible 50,000 hours and require absolutely no maintenance whatsoever along the way. What's more, LEDs are manufactured as a sealed unit with no serviceable parts or access required - hence their suitability for pool environments. If in need of a little inspiration, the Fibre Optic FX team is standing by to help. We can guide you through the various options available and provide you with countless ideas for enhancing and improving your pool experience. So whether looking to go ahead with an order or simply exploring your options, we'd be delighted to hear from you. Get in touch with a member of the Fibre Optic FX customer team today, for more information.